Halloween is fast approaching, and with it comes Halloween parties, classroom treats, and trick or treating. 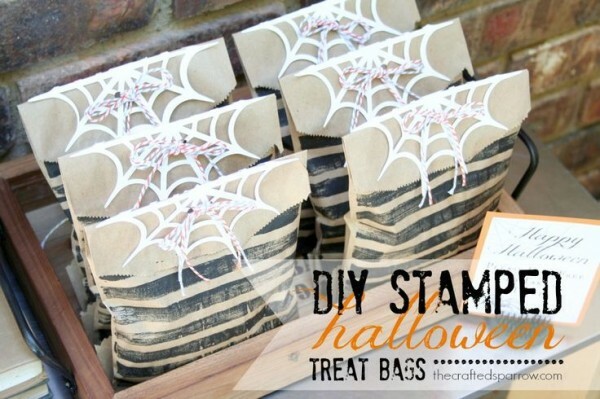 Why not dress up those Halloween sweets with one of these cute and easy stamped treat bags? Non-food Halloween prizes (think small toys from Oriental Trading ) can also be dressed up in one of these bags or boxes. Personalize your stamps with your child’s school initials or colors for the class party or if you’re holding a small get together, you could personalize bags for each of your guests. Best of all, these DIY Halloween stamped treat bags are a perfect way to use up those holiday paper scraps you’ve been saving. Let’s face it we don’t need an excuse to buy Halloween stamps right? very cute ideas love them all!! !